Perfect for your home, office or workspace, Quartet Connectible Bulletin Bars keep notes, lists and messages front and center. Connect multiple bars to create a customized display area of any length. Two squares of heavy-duty magnets and permanent foam tape are included for each bar. This allows for easy mounting on any metal or hard surface. Great for Organizing Review by Rod-Man, Inc. I purchased the Bulletin Bars to mount just under the cabinet doors in my work shop. I use push pins, also from Staples, to keep all kinds of notes from reminders to measurements to do's on the Bulletin Bars. When you are done with a note, just take it down and throw it away. I now have two sets of Bulletin Bars. They are very easy to install; anyone can do it. They are a great product, well made, easy to use, easy to install and the price is very good as well. There is not much more you could ask of a product today. Thanks Staples. Easy to install even on hard surfaces, comes with everything I needed and took less than 3 minutes to install. I am using this to stage my meeting notes as I plan my week. 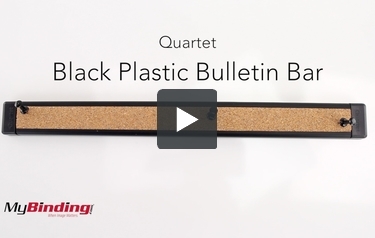 This is the Quartet Black Plastic Bulletin Bar. First, it comes with 4 pins so you can hang things right away. There are removable end caps and connectors. Easily put them together to be added onto the ends of the bulletin bar. For best results, place the sticky pads on these connector pieces so they can come on and off easily still. You can place the bar directly on the wall, or stick magnets to them. Make sure the glossy side of the magnet is NOT against the adhesive. Out of the box it comes with two bars, which you can connect together. remove the cap of one of them, remove the cap and connector of the other and bring them together. It is important that either a magnet or adhesive is on every connector because the connections are not very secure when placed into the bar. You can also sign up for our weekly email which only sends out coupons and special deals.